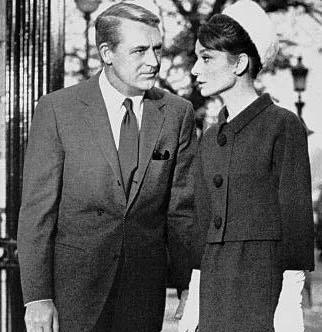 Heading back to business for the first day in the new year, nothing is more appropriate for a winter’s day in the office than a charcoal flannel suit similar to the one that Cary Grant’s multi-named hero wore to the office for the finale of Charade. 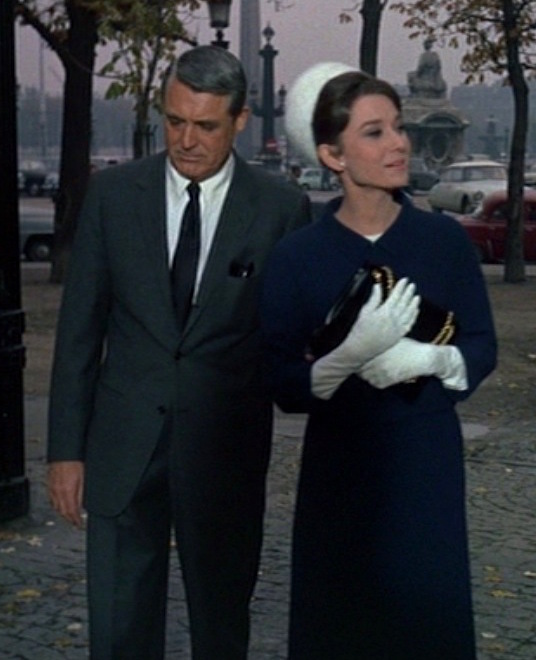 Accompanying Reggie Lampert (Audrey Hepburn), Brian Cruikshank is directed to his own office at the U.S. Embassy while wearing a warm charcoal flannel business suit that reflects a cyanic shade in certain light. What about a second suit? Well, I think a grey worsted or flannel would be most serviceable. Not too light in color, not too dark. And, this time, of medium weight but not more than what is known as ten-ounce cloth. Brian Cruikshank in his office. The single-breasted suit jacket has notch lapels that are fashionably slim for 1963 and gently roll over the top of the three buttons down the front. He carries his thick-framed eyeglasses in his welted breast pocket. The ventless jacket also has straight, jetted hip pockets and 3-button cuffs. 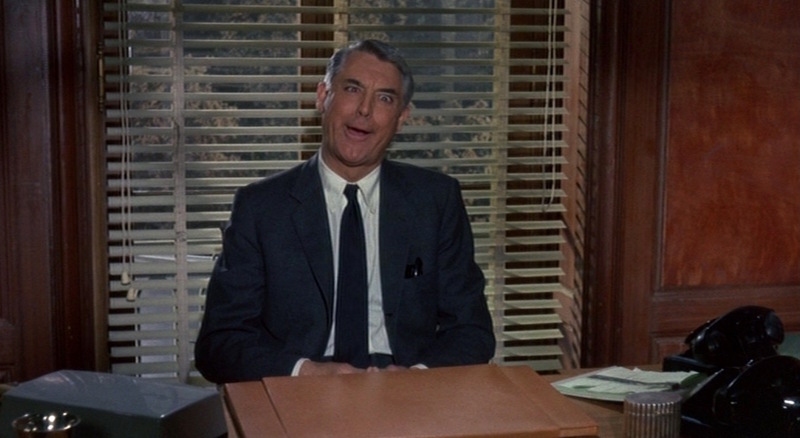 One of Cary Grant’s less suave moments… and yet still charming. The flat front trousers rise just high enough to perfectly meet the pointed blade of his tie and the center button of his jacket. Not much is seen of Grant’s trousers in this sequence, as he spends most of it with either his jacket buttoned or behind his desk, but they are likely styled the same as his others with straight side pockets and two jetted back pockets. He also appears to wear his trousers with a belt, as he did in other scenes for clipping his holster. Grant’s poplin dress shirt is pale ecru, just a shade away from white, with the same semi-spread collar with longer points designed to de-emphasize Grant’s muscular neck. The shirt has a front placket and single cuffs – rather than double, or French, cuffs – for his silver rectangular cuff links. His silk tie is dark blue. And back to being suave! Grant likely wears the same black leather 2-eyelet plain-toe derby shoes and thin black dress socks that he wore with his earlier-seen dark navy suit. 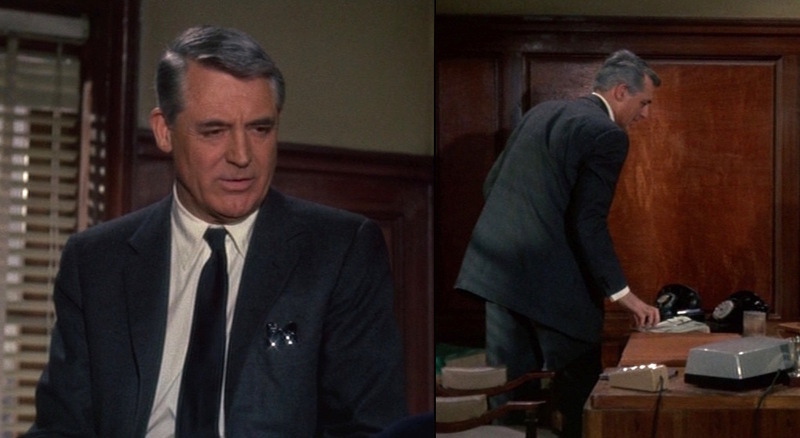 A timeless style icon, Cary Grant exemplifies an ideal springtime business suit with his charcoal flannel in Charade. Check out the movie and try to get the Criterion Collection version, which was restored to the highest quality after the various low-definition versions released during the film’s tenure in public domain. Reggie: Is there a Mrs. Cruikshank…? Brian/Adam/Peter: My mother, she lives in Detroit, you’d like her… she’d like you too. I tend to schedule my posts pretty well in advance. For some reason, all of my first 2017 posts (until Cary Grant’s birthday on January 18th) are all from movies with titles that begin with the letter “C”. Hm. You know, I can’t help thinking that his collar is a hidden button down. Just the way it curves around the knot but is flush at the points. Can’t really get a good look, but that’s what it looks like. I think his eyeglasses were Rodenstock Roccos. Not 100 percent positive though. Picked up some Mission Belts since you mentioned it in an earlier post. Thanks for the tip! Great thinking – thanks! I will have to rewatch the scene (or the whole movie; always nice to have an excuse!) and see if I can get more insight. Was that Grant’s preferred eyewear in real life? I hope the Mission belts have been working out for you! I’m a big fan and will definitely need to pick up more. Yes he wore the Roccos in real life. And the Mission Belts are fantastic! Already have three belts and a collection of buckles. Greatest tip evah ! I’ve noticed that collar on CG in other films as well. Happy New Year, LS! 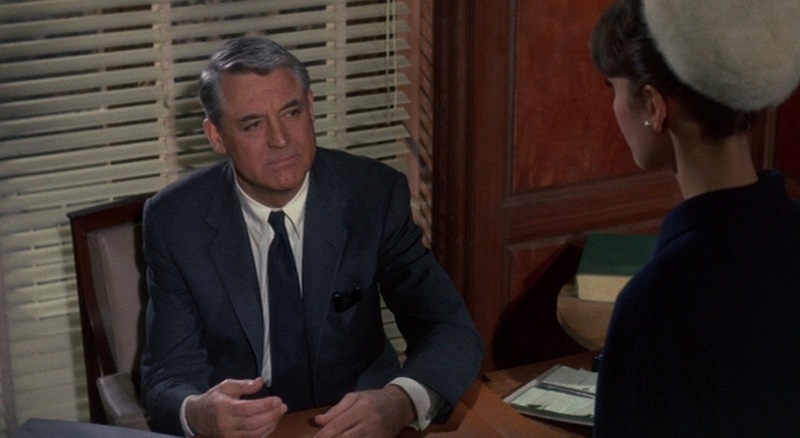 Cary Grant (and Bogart) is my favourite actor of Old Hollywood, and “Charade” is a favourite of mine. The best Hitchcock film that Hitchcock never made, I heard it referred to. Nice write-up. Now I’ll have to hunt up the Criterion disc of this film. Man, as if January isn’t an expensive month already in my house!